Filipa Lynce, MD, medical oncologist and associate professor of medicine at Georgetown Lombardi, received the John Potter Award, which was established last year in honor of Georgetown Lombardi’s founder, John F. Potter, MD, to recognize the achievements of an early career researcher. 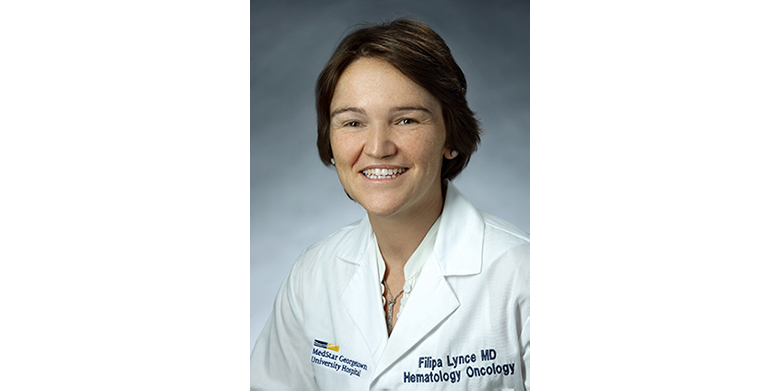 (November 21, 2018) — In the ten years since coming to the U.S. from Portugal to complete her medical training, Filipa Lynce, MD, has conducted clinical trials to establish safe and effective cancer treatments for minority patients, including African Americans and Latinas, and studied the genetic differences in cancers among patients of different ethnicities. Now a medical oncologist and associate professor of medicine at Georgetown Lombardi, Lynce has also looked for ways to reduce the health disparities associated with race and socioeconomic status, such as increasing the diversity of clinical trial participants and studying interventions that can help minority patients. In recognition of her work, Lynce received the John Potter Award November 17 at the 32nd Annual Lombardi Gala. The award was established last year in honor of Georgetown Lombardi’s founder, John F. Potter, MD, to recognize the achievements of an early career researcher. In one of her recent clinical trials, Lynce wanted to determine if African American women, who are known to be more likely to have a genetic condition that causes low white blood cell counts, could safely receive a drug that can also cause low white blood cell counts to treat breast cancer. She was awarded one of the first investigator-initiated research grants from Pfizer, the company that makes the drug, to carry it out. Including people with more diverse ethnic backgrounds in clinical trials is important for medical research and for patients. “If we don’t make sure that our patient population is diverse in the clinical trials, we cannot really tell our minority patients that ‘I know what to do based on the clinical trials,’ ” Lynce said. “We are extrapolating.” Individual patients also can access, and potentially benefit from, treatments offered through clinical trials that they would not have access to otherwise, she said, and excluding minorities denies them that benefit. Researchers know that people with different ethnicities respond to medications differently. Lynce has also found there are differences in the genetic mutations of three types of cancers in African Americans and Latinas versus Caucasians, suggesting that genetic differences associated with a person’s ancestry affect how cancers develop. In addition, lack of access to regular preventative care, choices in treatments and clinical trials influence health outcomes for minorities and people of low socioeconomic status. Lynce has studied ways to overcome these problems as well, and thinks better communication and outreach by medical staff are part of the solution. For example, cancer in Latinas is more likely to be diagnosed at a later stage, and to be harder to treat than breast cancer in non-Hispanic white women. To specifically understand Latinas’ behaviors, Lynce conducted a study to determine the factors that influence their cancer risk management and whether interventions to increase the likelihood they will take preventative measures are necessary. In addition to English and Portuguese, Lynce speaks Spanish and says she likes to use it to talk directly with her Hispanic patients, even if she makes mistakes. “I think it’s a good icebreaker — sometimes they laugh when I use some expression that they don’t know, and they help my Spanish get better,” Lynce said. But she’s also found that having a conversation directly with a patient, rather than an interpreter, can bring out information that allows the medical team to better understand a patient’s life, their challenges and their treatment decisions.